Rigid Streamlined Construction — Provides Strict Anti-vibration Protection and Enables Shortest Cabling Routes The A-S3000 has adopted a newly designed highly rigid double structure construction in order to achieve profoundly pure and accurate audio amplification. The bottom chassis and insulator ward off external vibration and provide each circuit board a floating structure supported by an independent inner frame, thoroughly eliminating the impact of vibration. And the power source unit, which consists of a power transformer and capacitors, which are major sources of internal vibration, is fixed firmly with a three-dimensional structured inner frame and is supported solidly by the front panel and the rear panel. The power amplifier circuit board and the weighty heat sink are attached to the left and right inner frames. The power supply unit and amplifier circuits are thus structurally isolated, achieving an ideal chassis structure which thoroughly blocks the transmission of vibration. Moreover, the inner frame that supports the power transformer is shaped with ample space below it, allowing passage of the wiring to each circuit over the shortest possible route. The newly developed chassis with this innovative structure helps to minimize the length of the signal paths and achieve low impedance, as well as providing high rigidity and anti-vibration benefits. The result is a dramatic reduction in signal loss, for remarkably pure audio amplification. Large Toroidal Transformer, Solidly Mounted with Independent Three-dimensional Inner Frame An independent three-dimensional inner frame has been employed in order to provide a more solid mount for the large toroidal transformer, which is installed in the center of the A-S3000, considering the ideal weight balance. The completely copper-plated inner frame has a structure which integrates the front-back and left-right frames with a convex-shaped highly rigid main frame as its base, reducing vibration coming from all directions. For the base, to which the power transformer is installed on the inner frame, brass was selected by strictest examining the particular sonic properties of various materials by exhaustive listening tests. This material effectively reduces vibration caused by the power transformer, helping to create sound of greater clarity and spaciousness. Comprehensive Low Impedance Design, Shortened Signal Paths and Copper-plated Chassis In order to achieve the absolute purest signal transmission, capable of communicating even the most subtle nuances of the music and its powerful dynamism—for example, reproducing powerful, agile low frequencies and portraying all the emotional nuances of the human voice—we’ve methodically pursued low impedance throughout the A-S3000. Using a double construction design creates space for cables under the bottom of the chassis, enabling the shortest cable path for the supply of power from the transformer to the power stage and for the audio signal transmission path. This helps to eliminate signal transmission loss and to smoothly supply power, even during high-volume transients, and allows more direct audio reproduction without even the slightest adverse effect on the music. Also, the three-dimensional inner frame to which the power transformer is mounted is copper-plated. Extremely low impedance is assured by lowering the ground potential. This sharply lowers the impact of noise and delivers a profound and richly emotional sound—one that perfectly communicates all the original expression of the artist1. 1/4 Inch Thick Top Panel Made of Non-magnetic Aluminum Plate The top panel and the front panel are made of aluminum, a non-magnetic material, in order to eliminate any adverse effect on the audio signals. In the course of strictest examination of the sound quality, the front panel thickness was set at 0.28” and the top panel was set at 0.24” . This helps to realize an exceptionally natural, spacious sound by providing a highly rigid chassis structure and at the same time, skillfully controlling the impact of vibration. Moreover, heat dissipation openings on the top panel were formed by high precision cutting from both sides—front and back—of the panel and finished with thorough scrupulous attention to every detail. Stylish slits in the center, matching the companion CD-S3000 and its design, strongly emphasize the powerful power source unit inside by having the same width as the power transformer. Insulators Allow Use of Spikes or Pads The insulators are crucial parts that block outside vibrations. They adopt Yamaha’ s original metal legs in order to maximize vibration control performance. The user can select point installation by applying the supplied spikes or plane insulation with the supplied pads and use these combined with an interlocking rack if desired. Left-right Symmetrical Design for Independent Preamplifier and Power Amplifier Blocks The amplifier circuit design features independent preamplifier and power amplifier blocks and perfect left-right symmetry. Separation of the preamplifier, which handles low energy signals, from the power amplifier, which handles high-energy amplified signals, greatly reduces sound deterioration caused by mutual interference. Moreover, the left-right symmetrical design, which keeps the left and right power stages completely separate, ensures greater channel separation and enhances clarity of the stereo image. Floating and Balanced Power Amplifier with MOSFETs The basic design of the power amplifier circuit adopts Yamaha’s proprietary Floating and Balanced Power Amplifier technology. Adopting output elements with the same polarity on the plus and minus sides of the output stage and also completely separating the NFB (Negative Feedback) circuit and power supply into a total of four plus and minus sides of the left and right channels, results in thoroughly symmetric push-pull operation of the output stage. Completely floating the entire power amplifier circuit from the ground removes any negative impact of minute voltage fluctuations or ground noise. Moreover, the output elements are comprised of MOSFETs, which provide a warm and natural sonic character. The use of MOSFETs, which have the same polarity on the plus and minus sides, further evolves the ideal of a complete symmetrical design, to eliminate sound quality variations due to difference in polarity—a major distinguishing characteristic of the Floating and Balanced Power Amplifier—resulting in sound with a superior signal-to-noise ratio and a superbly well-defined sound field. All-stage Balanced Transmission The A-S3000 features fully balanced signal transmission. Moreover, the control system circuits (volume, tone, etc.) of the preamplifier feature totally balanced operation, realizing ideal balance in all stages. Direct Drawing Toroidal Transformer for Complete Elimination of Signal Transmission Loss The cabling of the power transformer adopts an ingenious method in order to significantly reduce impedance. The winding of the transformer itself is directly connected to the terminal with a screw, unlike with conventional cabling. This enables a power supply which thoroughly limits connection loss and energy loss caused by soldering. The toroidal transformer was selected with top priority on sound quality, contributing superior strength, as well as a profoundly natural and spacious sound. Exceptionally Low Impedance Through Secure Screw Connections In order to completely eliminate signal energy loss, important parts of even the circuits employ screw connections. In addition to wiring of the block capacitor of the power unit—which is the real heart of the amplifier and as such requires high power—screw connections were adopted for all crucial spots of signal transmission, including the connection of the preamplifier circuit with the power amplifier circuit, and the cabling to the speaker terminals from the output stage of the power amplifier. In addition to making the signal path as short as possible, this significantly lowers the impedance and greatly reduces signal loss. Superior Quality Electronic Volume Control for Optimum Sound We’ve utilized a high quality digital volume control specially designed by New Japan Radio Co., Ltd., which consists only of ladder-type resistance, removing the impact of slew-rate decline or coloring of the sound, delivering higher purity in the sound and excellent, fast response to large volume changes and steep transients. Discretely Configured Phono Amplifier The phono amplifier is comprised of an MC head amplifier and an equalizer amplifier, each of which are discretely configured, resulting in a rich sound with pronounced musicality, when playing vinyl records with both MC and MM phone cartridges. Exquisite, Large Level Meters Reflect the Dynamics in The Music The A-S3000 features large level meters on the front panel, giving a direct visual sense of the dynamics and pulse of the music. These beautiful meters are softly illuminated by LED, lending a warm, lamplight look. The meter indicators can, in addition to the VU display, be switched to peak display, and can be selected according to the user’s preference. Moreover, the glass window of the meters is diagonally cut and precision-fit to the back surface of the front panel, leaving no gaps and using no screws for connection—lending an exceptionally elegant appearance to the unit. 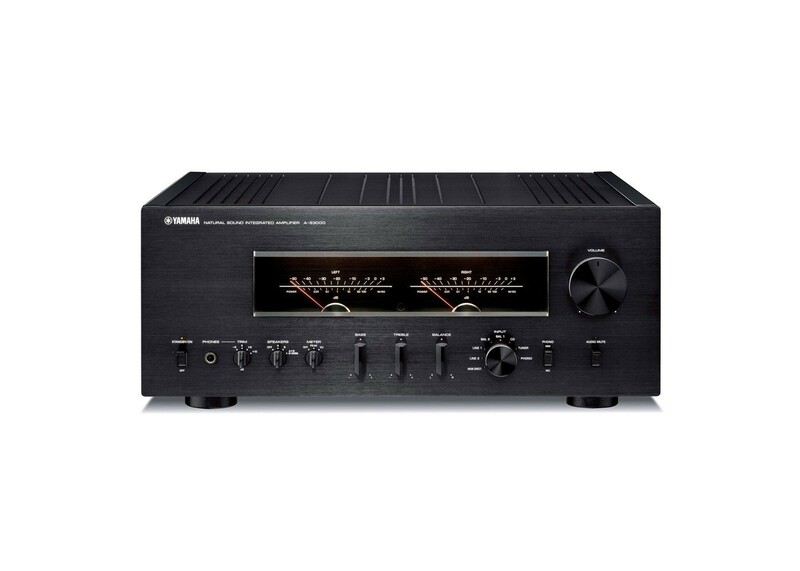 Meticulously Designed and Beautiful in Appearance — Just Like a Musical Instrument As befits a top-end audio component, the A-S3000 gives off the presence of a fine musical instrument, with absolutely no screws or fasteners that can be seen from the outside. Every single aspect of its construction and design exudes master craftsmanship and reflects an obsession with quality—a truly musical quality possible only for Yamaha, a world class musical instrument manufacturer. The amplifier with its refined design has been meticulously finished by the skillful use of advanced processing technologies: integrating the top panel and side wood connection, leaving no gaps while using different materials—metal and wood—for the connection. Original Speaker Terminals for High Sound Quality, as Well as Beauty and Ease of Use The speaker terminals are the final link in the audio chain of this amplifier and have also been designed with meticulous obsession. The screw-type terminals have large handles and feature an original design that has been crafted by cutting pure brass to enable a secure connection with no reduction in sound quality. Moreover, the shape conforms nicely to the human fingers—not only creating an elegant visual impression, but also allowing users to turn them easily and to firmly tighten them with minimal force. Obsessive, Meticulous Switch Design — Elaborate, Richly Textured, Easy-to-use Since the controls—the volume dial, switches and so on—are the parts of the amplifier which users actually touch and feel directly, their surface texture and design were created with the strictest attention to detail. Individual controls such as the volume or input switching dials, emanate a richly elegant feel thanks to the use of cut aluminum knobs. Switches, including the power switch, were made with obsessive attention to texture in every detail; they were shaped with refined craftsmanship so that when they are raised or lowered, the gap between the switch and panel surface is impossible to see. Remote Control with Simple Design and Superior Texture The supplied remote control features a design complementary to the aluminum panel of the amplifier itself, with a simple, easy-to-understand button layout and gorgeous metallic texture. In addition to the basic volume adjustment and input switching controls of the A-S3000, it can also be used for operation of the companion CD-S3000.